Three years after its original release on PC, Activision is bringing Chivalry: Medieval Warfare to PlayStation 4 and Xbox One. Releasing on December 1st, the 24-person online multiplayer game features over 25 maps and a new horde mode. 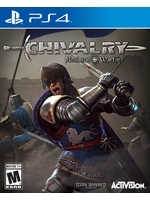 SANTA MONICA, Calif. – Nov. 19, 2015 – Activision Publishing, Inc. has announced it will bring Chivalry: Medieval Warfare, Torn Banner Studios’ intense, melee-oriented action game, to the PlayStation®4 computer entertainment system and Xbox One next month. This new release features 24-person online multiplayer, over 25 maps, dedicated server support, and a new horde mode for teams of up to six. Chivalry: Medieval Warfare is expected to storm the PlayStation®4 via the PlayStation®Store and Xbox One through the Xbox Games Store in North America on Dec. 1 for $19.99 MSRP. Also launching that day for $29.99 MSRP on both platforms is Chivalry: Medieval Warfare Ultimate Edition, which includes the full game, plus the Barbarian Character Pack, Marauding Arbiter Pack, Inquisitive Dreadnaught Bundle and Barbarian Weapon Pack. Pre-orders for both versions are expected to open on Nov. 25 for Xbox One only. Chivalry: Medieval Warfare makes combat fast, forceful and precise with a deep melee fighting system and the ability to quickly switch between first and third-person perspectives. Lay waste to castles and villages as one of four distinct classes – Knight, Vanguard, Man-at-Arms and Archer – in battles of cold, ruthless steel across a multitude of solo and team-based modes. The game includes over 60 period-authentic swords, axes, maces, javelins, bows and more, complemented by a range of armors, helmets and siege weapons, including catapults, ballistae, boiling oil and battering rams. A number of cosmetic DLC sets, each sold separately, will also be available when Chivalry: Medieval Warfare arrives. The Barbarian Character Pack contains savage barbarian skins for each of the game’s four classes. The Marauding Arbiter Pack features new skins and helmets for the Vanguard class. The Inquisitive Dreadnaught Bundle holds new skins, helmets and special weapons for the Knight class. Finally, the Barbarian Weapon Pack delivers five brutal weapons of war. Shame they didn't upgrade it to UE4 for the port.